After incredible success on an initial UK tour, Opera North’s colourful production of Cole Porter’s red-hot musical Kiss Me, Kate transfers to the West End. Playing for limited performances at the London Coliseum, the magical show revives the original sound of Broadway and MGM for the London stage. 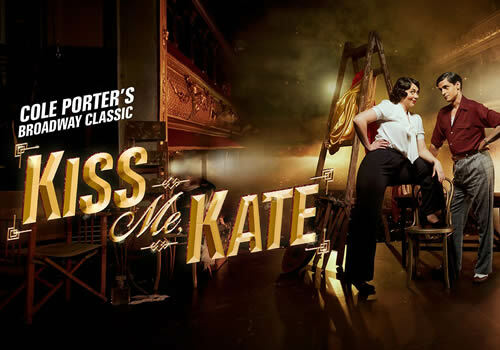 Kiss Me, Kate is the riotous musical that takes place both on and off stage during a production of a musical adaptation of Shakespeare’s The Taming of the Shrew. Set in 1940’s Baltimore, the story follows the tempestuous relationship between actor-manager Fred Graham and his leading lady, and also ex-wife, Lilli Vanessi. When you bring into the mix Fred’s current paramour Lois Lane and her gambling boyfriend Bill, who is on the run from some gun-wielding gangsters, chaos is bound to ensue! Quickly, the whole clan are caught up in the production, which becomes a farcical battle of the sexes! Stephanie Corley stars as Lilli Vanessi/Kate, with previous credits with Opera North including The Merry Widow. Cast members also include Quirijn de Lang (Trouble in Tahiti, The Marriage of Figaro) as Fred Graham/Petruchio, Zoe Rainey (An American in Paris) as Lois Lane/Bianca and Alan Burkitt (Top Hat) as Bill Calhoun/Lucentio. Additional casting includes Joseph Shovelton and John Savournin, Aiesha Pease, Stephane Anelli, James Hayes, Jack Wilcox and Malcolm Ridley. Featuring a book by Bella and Samuel Spewack, Kiss Me, Kate features jazz-inspired music and lyrics by Cole Porter. Well-known songs include “Another Op’nin’ Another Show”, “Brush Up on Your Shakespeare”, “Always True to You in My Fashion” and the show-stopping number “Too Darn Hot”. The production is directed by Jo Davies and conducted by James Holmes, with design by Colin Richmond, lighting design by Ben Cracknell and choreography by Will Tuckett. Bringing together performers from both opera and the West End, plus the Orchestra and Chorus of Opera North, the production plays limited performances at the London Coliseum from June 20th to June 30th 2018. Please note that under 5’s will not be admitted into the theatre.